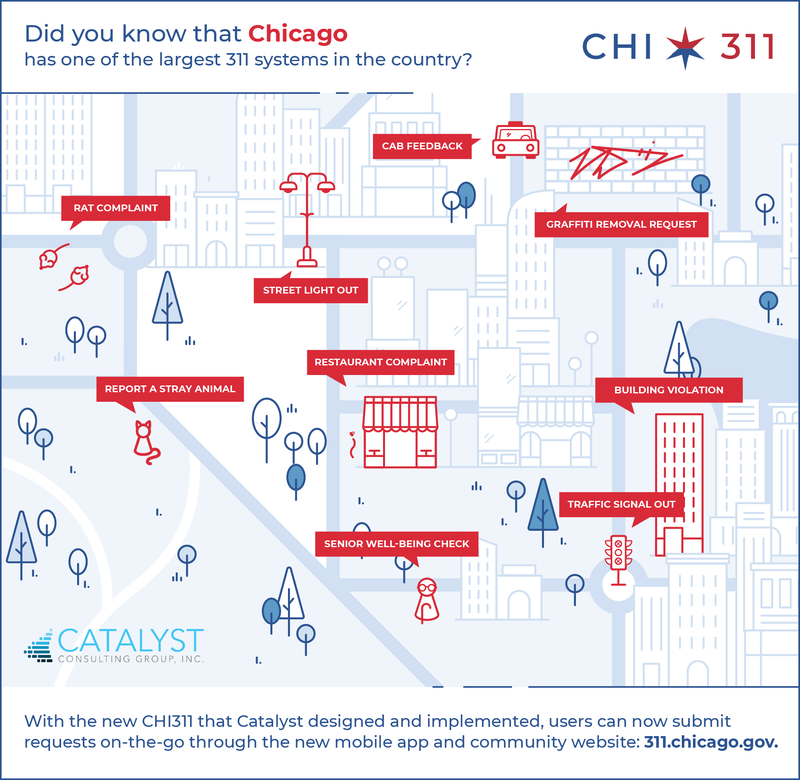 Catalyst Launches Chicago's New 311 System, CHI311 | Catalyst Consulting Group, Inc.
Chicago, IL – Catalyst Consulting Group, Inc. (Catalyst) is excited to announce the recent launch of the City of Chicago’s new 3-1-1 solution, CHI311. The new system was developed in nine months in partnership with Chicago’s Department of Innovation and Technology (DoIT), 311 City Services (311), thirty-three city departments, and Salesforce. The new cloud-based solution consists of a Salesforce-based constituent relationship management (CRM) system, a new community web portal, and Chicago’s first-ever resident-centric mobile application. Chicago residents can visit 311.chicago.gov or download the CHI311 App for iOS and Android today to explore neighborhoods and submit new requests to the City of Chicago. Catalyst worked closely with over 30 city departments that interact with 3-1-1 to understand their operations and needs for the new system. Team members analyzed over 1,000 existing service request codes, the unique processes held by each department, and the external systems they use to dispatch and manage their service delivery. CHI311’s cloud-based scheduling and dispatch tools replace paper-based processes and provide Commissioners and Alderman with real-time access to field worker data. Additionally, custom-developed code detects duplicate requests from users. This saves tremendous city resources by eliminating re-work, improving resource management, and preventing costly duplication of efforts by city field workers. Similarly, the Chicago-branded community web portal and mobile app provide users with an intuitive and holistic view of all service requests worked by the City of Chicago along with the status of those requests. Through CHI311 users can now view requests created across the entire city providing more transparency than ever before on the work that is being done throughout Chicago’s neighborhoods. The new CHI311 increases city transparency, improves the city-resident relationship, and fosters communication and collaboration between city departments. Catalyst is excited to continue to work closely with DoIT, 311, city departments, and Salesforce to support the new system and push updates that consistently enhance and improve the 311 experience for all users. Salesforce calls its community of partners and customers “Ohana,” the Hawaiian term for “family.” The Catalyst team is thrilled to have worked so closely with Salesforce and the City of Chicago, and we graciously extend the invitation to all Chicago residents to join the Ohana. You can visit 311.chicago.gov or download the CHI311 App for iOS and Android today to explore your neighborhood and submit new requests to the City of Chicago. About Catalyst Consulting Group, Inc. Established in Chicago in 1992, Catalyst has earned a stellar reputation as a consulting firm that leverages expertise in information technology and business strategy in both the public and private sectors. We are a minority-owned small business certified by a number of agencies and organizations across the United States. Our mission for 27 years has been to drive our clients’ organizations forward by transforming processes, increasing operational efficiencies, and maximizing return on investment. Catalyst has a rich history of using technology to transform the way municipal services are rendered to constituents. Our service areas include, but are not limited to, Salesforce development, CRM system implementation, 311 system best practices, custom application development and support, mobile development, user experience, information security, and infrastructure support. Catalyst’s work on the City of Chicago’s 311 modernization is an initiative that holds the title of the largest Salesforce 311/CRM implementation in American history. The Department of Innovation and Technology (DoIT) is the City of Chicago’s central IT organization, providing a number of technology and telecommunications services to departments, the Mayor, Aldermen, residents, businesses and tourists. Our offices are nestled in the heart of Chicago.